Fred's nametag reads: "FRED. I am not an old drunk!" 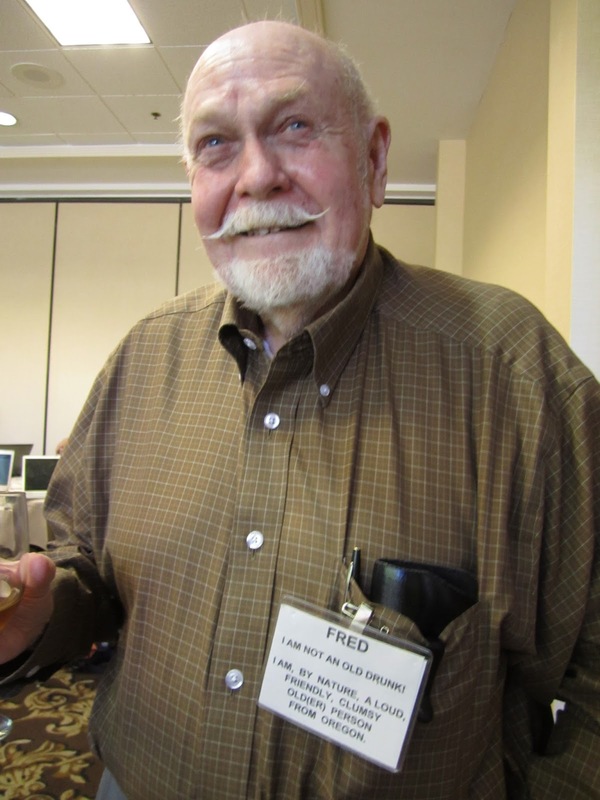 At the 2011 Beer Bloggers Conference in Portland, Fred Eckhardt's brief talk was so chock full of humorous quotes that I jotted a bunch of them down, thinking I would make a blog post of them. I never got around to it, and I probably hoped I would collect up some more and make a bigger post. But since we won't have any new witticisms from the great man after his passing this morning, I will release them to the world. I would be a blogger, but I'm just so damn lazy. I used to think to myself "If it's the water, why don't they do something about it?" (re: Olympia). This is the third beer revolution, really it's a counter-revolution. First was when someone figured out to throw hops into beer; second was when the Germans figured out how to make a clear beer that you would drink from a glass instead of an opaque mug, the cold-fermented lager revolution. Third is when people decided they wanted more than just those clean lagers. Lager is good, but after you've been drinking it for 50 years you start to want something else. If you have to quit after the first beer, what's the point? I wouldn't want to blame Belgium for that beer. It's great beer if it's in 2-liter mugs, I figure. Just about everyone that knew which end of the bottle to pour beer from liked that beer. There I was and there they were and there we were. Once you start workin' they expect you to keep doing that for the rest of your life. Rest in peace, Fred. Your work is done. I don't care so much about style, but about what I like. My palate isn't what it was last week.